Well, there has been enough time pass since the 4th of July. I can now post all about it. I took off a couple of days before the 4th, to spend with my girls. I had a few things that I wanted to accomplish, but my main purpose was to play with them. So, we tried hard to play. On Thursday morning we got up at the crack of dawn. Okay- 6:00. 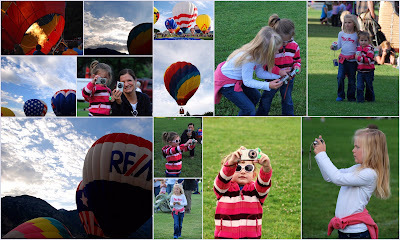 We headed down to the Freedom Festival Balloon Launch. It is really an amazing site. It would have been better if the balloons would have actually gone in the air higher than 20 feet. Hopefully next year. The girls had a blast and were really glad that we got up early and went. Funny little story about the differences in our two girls. Jade was the first one that I tried to wake up. To wake her takes several tries. She is soooo my daughter- in that way. She tossed and turned and moaned while keeping her eyes closed. Then I went in to Ivy's room and said to her the same thing I said to Jade. "Honey, do you want to wake up and go see the balloons?" She sits straight up in bed and says, "Yep, let's go and see the balloons" -- proving that she is her father's daughter. I sent both girls with their own camera. The first collage shows pictures from my camera and the bottom collage is a group of their pictures. Ivy's would be better if she would quit touching the lens with her sticky fingers- but we'll pretend it is a filter. My mom came with us, but I don't have her pictures to include in their own collage. I may have to get them and do another balloon post. We enjoyed the Kiwanis breakfast- an absolute must. 13 years ago, I was one of the Kiwanis serving breakfast for the balloon festival. I miss those days, but would pick going to watch the balloons with Jade, Ivy and my mom over going back in time. 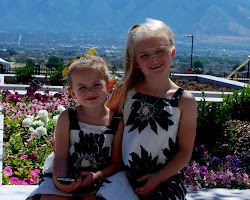 I am so grateful that we have two girls that enjoy doing things and like to experience life as much as they can. 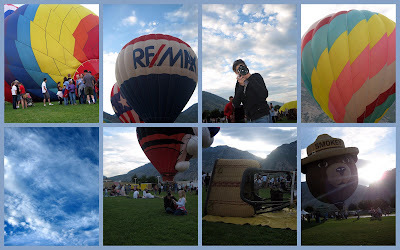 Next year hopefully we will get pictures of the balloons in the air.